In Sweden they say, dear child has many names. So also the crayfish. In Arizona they are officially called crayfish. But in Louisiana they are known as crawfish. In between these two names are numerous others, such as crawdads, mudpuppies, crabs and God knows what. When my mother brought home a container with "kr�ftor" from the market and dumped them in the kitchen sink, I knew at once I was looking at crayfish. Only crayfish have those sharp pincerlike claws that can draw blood if you're not careful. But I soon learned. You don't soon forget after being pinched by a decapod. As you are looking at this page, you most likely already know something about crayfish. But for those who don't, here are a few additional details about these interesting crustaceans. Yes, they are crustaceans, just like lobsters, their big salt water cousins as well as crabs and shrimp to mention the most commonly known. Crayfish live almost entirely in freshwater lakes and rivers, and they are found almost all over the world from my home country, Sweden, to New Zealand and most countries in between. Crayfish (and that's their official name in Arizona and English speaking countries) are nocturnal which means they are most active at night. However, I have caught quite a few crayfish during daytime hours, especially those that are hungry. Their food consists of animal and vegetable items. They eat snails, small fish like trout and even tadpoles. They also graze on marine vegetation. One day, when fishing for trout in an Arizona lake, I checked my first caught trout to see what they were feeding on. Crayfish! So crayfish eat trout and trout eat crayfish. Some kind of ecological balance. Some crayfish like to burrow in the mud. I have seen crayfish come up from holes in a well manicured lawn in a Detroit suburb and could not believe my eyes at first. If they burrow in an earthen dam, they could really cause trouble. According to my studies about crayfish, there are hundreds of varieties. I must admit, though, that most of them look about the same. But if you start scrutinizing them a little closer, you realize that there are differences. The first difference I noticed was in the Phoenix canals where I could find both the Louisiana type, reddish in shell and elongated claws, as well as the one I had seen in Scandinavia. This is a California signal crayfish. Note the white spots on its claws. That's the signal. They all have fancy latin names which I will not bother you with. 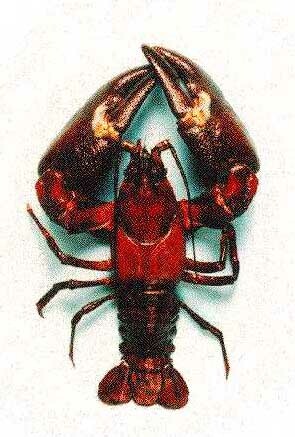 The Swedish crayfish is called the Flood Crayfish and is usually almost black in the shell. However, nowadays, due to the ravages of the so called crayfish pest, a new crayfish has been introduced in Sweden which is less susceptible to the pest. 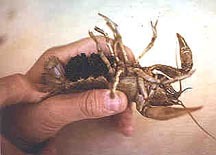 This is the California signal crayfish from the Sacramento River and it has a whitish spot on the claws. Females of most species have often taken an elevated position of male admiration and desire. So also with crayfish. In my home country, crayfish eaters stealthily search out the females from a plate full of males. And why? Because the females may have roe, or shall we call it caviar, which is an added attraction. If the roe is external, as in the picture, they are ready to join the other family members in the lake. But are they still internal, they become a tasty morsel among crayfish aficionados. One more thing about crayfish. They are eaten by humans all over the world. Believe it or not. In the US we all know the Louisiana Cajuns love them and feast on large amounts of cooked crayfish spread out on old newspapers. In Sweden they get together on August evenings, preferably under a full moon and colored lights, and drink, sing and eat their crayfish with gusto. Swedes have long assigned a high esteem to their crayfish. High enough that at least two counties in Sweden used the crayfish as their county seal just as the town of Astakus in Greece did many hundred years earlier, from which later a major species of crayfish was named. I could go into more detailed and historical descriptions of all the different types of crayfish we have, but believe me, they are all very similar and taste about the same.